Hot Bed Press currently employs four staff. Sean is the Artistic Director whose job it is to plan, develop and oversee the education programme, marketing, income generation and the raising of the profile of Hot Bed Press. Sean also runs the Complete Printmaker courses, and initiated the 20:20 Print Exchange, (now the largest print exchange in the UK). In conjunction with Karen Mercer he also organises the Manchester Artists’ Book Fair held annually at MMU’s Holden Gallery. Sean has a B.A. Honours degree from Loughborough College of Art, (now LUSAD), and a Post-graduate diploma and Masters Degree in Printmaking from Wimbledon School of Art. He wrote The Print Workshops Directory published by A & C Black and currently is feature writer on print workshops for Printmaking Today. Andy is the Operations Manager; responsible for developing and overseeing all operational and administrative work, including marketing, organising exhibitions and events, finance and bookkeeping, membership, workshop bookings and all communications. He was awarded a ‘New Entrepeneur Scholarship’ and studied Enterprise Management at Manchester Metropolitan University. 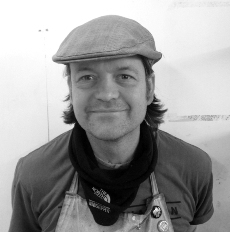 Andy has a Degree in Fine Art from Leeds Metropolitan University and is a successful artist in his own rite specialising in painting and screenprinting. He has been shortlisted twice for the prestigious John Moores Painting prize, has exhibited nationally and internationally and his work is in many public and private collections. Martin became Technician in January 2013, having been involved as a volunteer and as a tutor for many years. Martin supports members and maintains equipment and materials. He brings with him on-hand expertise in many aspects of printmaking. 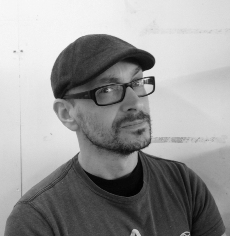 He is well versed in all printmaking offered at Hot Bed Press and has a degree in Fine Art Sculpture from Hull University and more recently an MA in Printmaking from UCLAN, Preston. Martin was also one of the founders of Unicorn Grocery a world renowned workers co-operative based in Chorlton, Manchester. Martin has also taught on the Illustration course at MMU and has been guest tutor at The Bluecoat, City College Manchester. Lois joined the team as Technician in February 2014 and currently works Thursday evenings and Friday days, also covering our monthly Saturday at Hot Bed Press. 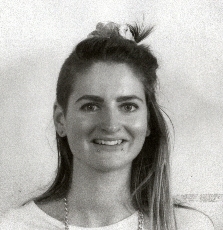 Lois graduated from MMU in 2012 with a degree in BA (hons) Fine Art where she specialised in printmaking. She recently completed a teacher training qualification develop her teaching style. She teaches printmaking classes and workshops at Trafford college where she is also a technician in the Creative Arts department. Her own work combines screen-printing and painting, exploring lettering and the relationship between text and image. We are also helped by a team of Volunteers. To find out more about volunteering opportunities click here.